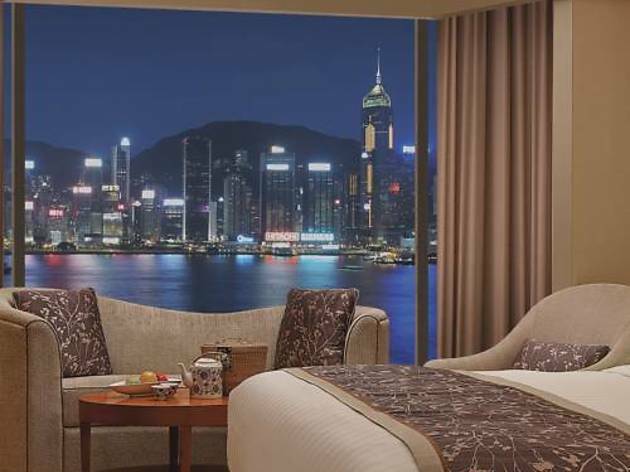 Located in the lively Tsim Sha Tsui District and only steps from MTR East Tsim Sha Tsui Station, Kowloon Shangri-La overlooks Victoria Harbour. The luxurious hotel boasts 7 dining options, indoor pool and rooms with free wired internet. Free WiFi is also provided throughout the hotel. Kowloon Shangri-La is a 35-minute ride from Hong Kong International Airport and a 20-minute ride from Kai Tak Cruise Terminal. The hotel is a 15-minute walk from Star Ferry Pier, Ocean Terminal, the Museum of Art and Space Museum. Hong Kong Disneyland is 23 km away. Featuring elegant decor, spacious rooms here have floor-to-ceiling windows with views of the city or harbour. Each room is equipped with satellite TV, a large work desk and a tea/coffee maker. Shangri-La’s health club offers a 24-hour fitness centre, a swimming pool and massage services. Other facilities include a well-equipped business centre. There are 7 quality themed restaurants at Kowloon Shangri-La, including a Michelin Two-starred Chinese restaurant Shang Palace. Savour wine at Tapas Bar or enjoy a refreshing cocktail at Lobby Lounge.